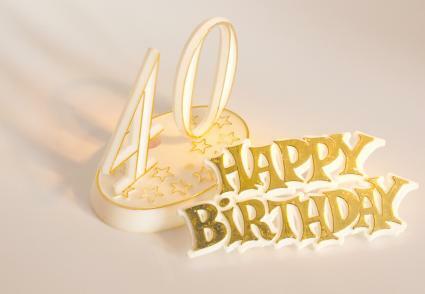 A 40th birthday is a milestone worth celebrating. The wording for a 40th birthday invitation should set the tone for the event. You can flavor the invite with a touch of humor to take some of the sting out of reaching this milestone, or take a more sentimental approach. Many of these parties are also surprises. Whatever you're planning, get a few wording samples that will help you customize your invitations. It's perfectly acceptable to choose pre-printed invitations to send out the word about an upcoming birthday party, but you might be missing out on a great opportunity if you do. When the party is for a milestone birthday, such as 40th, you want the words to be just right. Writing your own verse for the invitation is a great way to add some flair to the invitation. To get the creative juices flowing, here are some examples of wording for a 40th birthday invitation. Remember that the more personalized you make the invitation, the more special it will be to the honoree. Be sure to keep a copy for him or her to commemorate the occasion in a scrapbook or photo album. Sandra is turning the big 4-0! She's over the hill-She's OLD! - Oh no! On June 30 at 5 p.m. for a celebration that won't be beat. by June 20th to RSVP. A teacher whose last 40 years have been great. Let's make her 40th birthday out of sight! Please come to an open house honoring Mrs. Susan Johnson on her birthday. March 12, from 2 p.m. until 5 p.m. at the home of Jane Anderson. RSVP to Jane at jane@emailaddress.com by March 1. Address and directions are on the back of the card. A SURPRISE party is planned for him on April 2! Be at the Washington Park shelter house by 4:45 p.m. and don't be late. Call Robert to RSVP at 444-0987 by March 25th. Here are some more short but creative verses you can add to your standard invitation wording. But she still looks sporty. That just proves how time flies. So let's throw her a surprise! And we really hope it shows! But she's/he's not over the hill just yet. That she/he never will forget! There's a blaze out of control. Wow, he's/she's 40 years old! And you won't believe your eyes. He/She still looks really great. So we're throwing her a surprise! So we're throwing a surprise party! Will be so much fun. Although you may get caught up writing your invitation card verse, be sure to include all of the important birthday party information. If you can't work the "facts" into the verse, simply add a "who, what, when, where" at the bottom or inside of the invite. If you are planning a surprise party, make sure you're clear about that. Mention it several times within your invitation, and maybe even emphasize it by making the font boldface in these places. Whether you plan to mail out your invitations or send them via email, there's one rule of thumb you really must follow. Proofread your invitation carefully! Check for missing information your guests truly need, and make sure there aren't any typos that will spoil the look of the invitation or make it difficult to read. A 40th birthday party only happens once in a person's life, so make sure you get the invitation wording just right.